Sahastralinga Talav was a large reservoir named for the 1,000 shiva lingas or shrines it was supposed to have had on its banks. Today, not a single shiva linga or shrine can be seen, though ruins of what could have been a temple exists at the end of one embankment with some pillars still standing upright today. 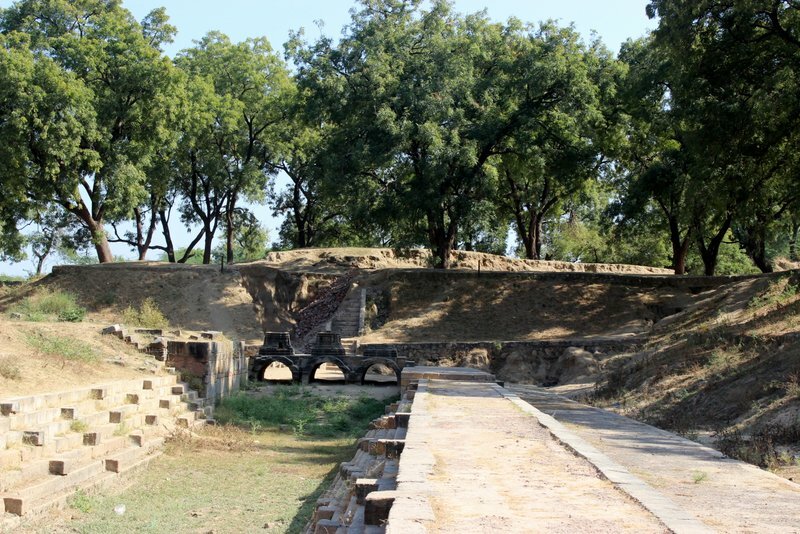 According to the information board placed at the entrance, the Sahastralinga Talav covered an area of 5 sq.km. and was fed by waters from the River Saraswati. The reservoir’s embankments were made of stone and had steps leading to the water. It was a good idea walking along the water channels and imagining the hub it must have been almost a 1,000 years ago. The prayers, the pujas, the devotees and the large body of water in an area that received very little rainfall. In India, temples have always been built close to water sources and the 1,000 shiva lingas / shrines that the Talav was supposed to have had would not have been unusual. But the significance of these shrines would have been far more greater considering how precious water was in the region. It was not so much fun imagining the river drying up and the Sahastralinga Talav going to waste and getting buried under silt, sand and mud. 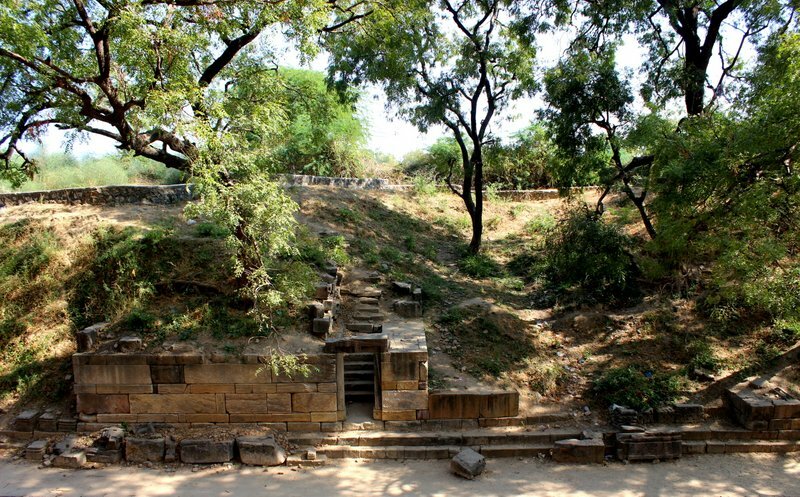 The Talav was excavated by the Archaeological Society of India (ASI), when the monument came under their care. And while we are on the subject of the ASI, let me share an “interesting” conversation with you. When I arrived at the Sahastralinga Talav, I noticed an enclosure with a board that announced it was a museum. Since it was locked, I decided to visit it after I had finished seeing the Talav. When I went to see the museum on my way out, I found that it was still locked. The ASI Office was close by so I went looking for someone who could open the museum for me. I found the security guard who flatly refused to open it, stating that the museum was not meant for the public ! I asked to speak to someone else from the ASI Office. That someone else (who refused to give me his name) also refused to give permission to open the museum. His reason? School children are careless and spoil the exhibits ! Some calls were made and I was made to speak to some “Bade Sahab” (who also refused to give his name) in Ahmedabad. Only after “Bade Sahab” was assured that I didn’t sound like a school-going kid and neither did I have any with me did he give permission to the security guard to open the museum doors for me. It was quite obvious that the museum was not opened regularly for the guard struggled to open the rusty lock with an equally rusty key. And guess what? The key broke in the lock and that was the end of my attempts to see the museum. I had to be content with seeing it through the grill and this tantalising photo. While I understand that the ASI operates under considerable financial and humanpower constraints, they are taking their mandate of “…protecting the monuments and sites…” a little too seriously by keeping out people. Such is the state of our national treasures ! PS: I really need to know: do I look like a school-going kid? Patan is just 140 km from Ahmedabad and can easily be covered as a day trip. Though I visited the Sahastralinga Talav after Rani ni Vav, I would recommend that you visit the Talav and the Museum (if you’re lucky) first and then Rani ni Vav. Please write to the ASI and make a strong complaint giving details of the date you visited the museum and do ask them if they have changed the broken key and lock. They always make up some excuse to prevent genuinely interested people from viewing their treasures. Hi Aadil, I will doing that soon as I have a long list of issues to pick with the ASI. The thing about ASI’s policy is that they genuinely believe that they are doing the right thing by behaving the way they do. Such an attitude is beyond detrimental and is unacceptable in spite of their constraints. What a lock and key story! So many of our wonderful heritage sites are lying uncared for with even the ASI being only ‘too careful’ in protecting what have been pillaged and ruined over the centuries. We had some great indigenous technology, especially in water systems and storage techniques in arid places like Rajasthan and Gujarat. If not tryi to study and publicise them, they can at least open them to interested people who would. During my recent visit to Shekhawati came across numerous stepped tanks and one step well. All of them, without exception were dry. But more than anything else, they seemed to be places to dump unwanted stuff, and for what can be politely termed as ‘anti-social’ activities. I fully appreciate and understand the constraints that ASI faces, but to not open a museum that is already in place for the stupidest of reasons is not done. Yes, I can imagine what the talav would have been then. Like you, I am amazed at the skills of the people then when creating such marvelous monuments – the thousand shiv lingas, the water cistern and channels. 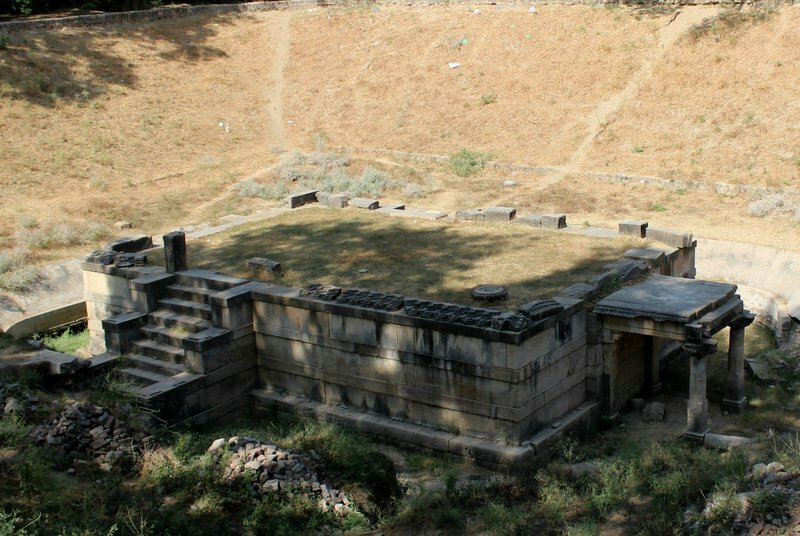 As for the ASI – it is just not the case of ‘preservation of archeological sites’, but also a case of lazy staff who do not want to trouble themselves with maintenance or educating/guiding the public and tourists. What do do, Neena. It is like being caught between the devil and the deep blue sea. One the one hand we have people who are not interested in heritage and one the other hand we have protectors of heritage behaving like this. Who is to blame? I was also disappointed as there was no comprehensive drawing of what the Sahastralinga Talav would have looked like with the reservoir the channels bringing water, the cistern, the temple, the shiva lingas. These are important for people to get an idea of the place. But no. Apart from an information board there was nothing. Thank God for imagination. 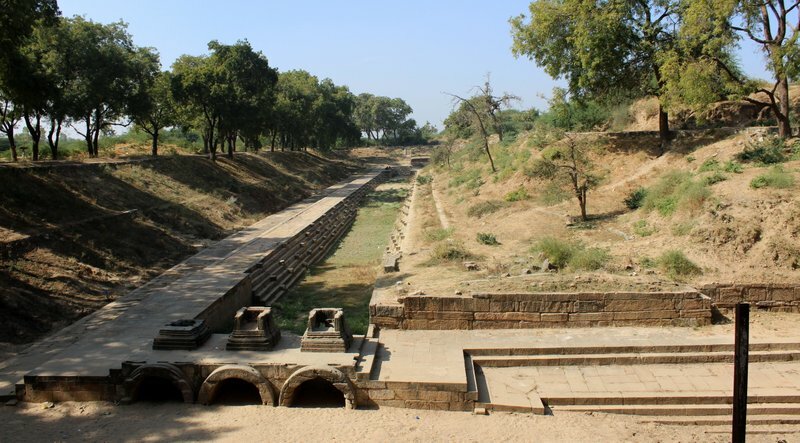 Even though I had seen photographs of the Talav before I visited it, the size and scale was still a surprise for me. And of course, the water engineering as well. I have been at the receiving end of both good and bad practices of the ASI. The problem is a lot of decisions are taken by the local staff. At the onsite museum in Modhera, the security guard followed me like a shadow and he wouldn’t budge. Yes, past behaviour of people may have led them to lock it up, but it is still a wrong decision. Sounds like a good place to visit. I wonder why the talas got covered with silt. Intense floods, I am sure. Yes, Param. The Sahastralinga Talav is a marvel and a must visit. Not as famous as the Rani-ni-Vav in Patan, it is nevertheless just as important a monument. As regards silting, floods for one, but also deposition of sediments over the centuries. I’m marveled at your multiple interests and oh yeah living in a city as vibrant and amazing as Mumbai I can’t see why not. The ruins of this temple stand tall to recite the greatness of the architectural labor years ago despite developmental limitations.